So you burn the files on DVD-ROMs, and then you look at your shelf and wonder where what song is located, right? And if you just love music, you probably have a large number of Audio-CDs, and likely a large number of other audio files, maybe in AIFF, MP3, or AAC format. abeMeda is just the right tool for you! abeMeda reads all meta data from MP3 and AAC files, such as song title, album, year, genre, bit rate, sample rate, duration, even the lyrics and the cover art! For AIFF and WAVE files, abeMeda will get you the duration, bitate, and sample rate. 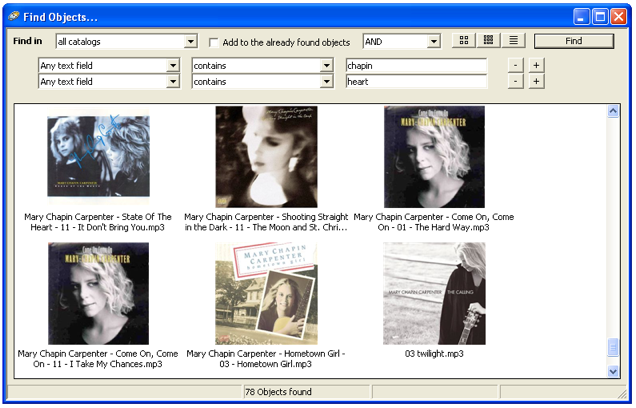 All your Audio-CDs are also catalogued by abeMeda, with full support for CD-TEXT, ISRC and MSN - and also much more like title information or ASIN with a little help by MusicBrainz or the freedb internet database.